This is another example of the type of welfare work we do at the project. 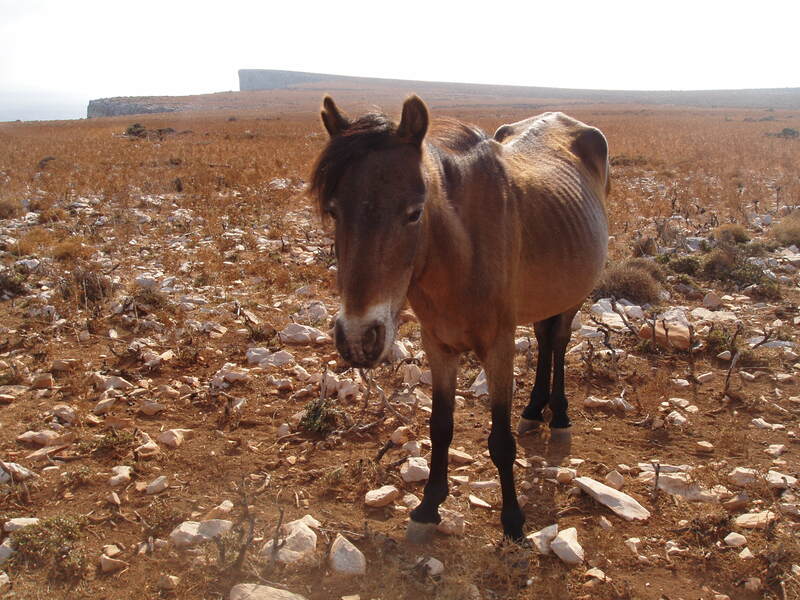 In the summer ponies are sometimes left on the mountain and frequently there is not enough food or water for them, particularly if they have a foal at foot or are old and vulnerable. This is Milly. She was found in the late summer of 2007 on the mountain with a foal at foot. At the time she was approximately 13 years old and had a 6 month old foal at foot – Effie – who was also very malnourished. We brought her and her foal down from the mountain and slowly began to feed her a protein- and calcium-rich diet, with alfalfa hay, meadow hay and oat straw, as well as vitamin and mineral supplements. Alongside this we introduced her to dental treatment via the Greek Animal Welfare Fund vet who floated her teeth. We also put her on a strict worming programme. It took about one full year for her to really gain a correct weight. She is a pony that needs regular dental care, a protein-rich diet and regular worming. Milly comes with other problems too. She has found it very hard to trust people. It would appear that at some point in her life she has suffered at the hands of those who don’t understand the needs and sensibilities of horses. At first she was scared of having a rope or headcollar near her, terrified of having her feet handled, and difficult to catch. We have taken a long time to build a trusting relationship with her; we can catch her, put a headcollar on, and pick up her feet. She loves Stathis, but she finds it hard to trust new people in her environment. 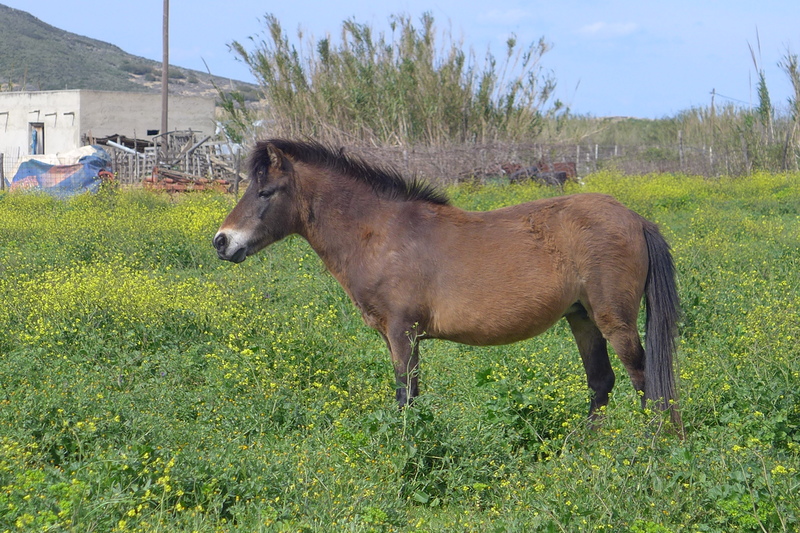 One of the ways we have helped her is by homing her with other ponies that adore humans such as Nefeli and Ifestos who can’t get enough of people (pictured above). This is Milly now in April 2015 at approximately 20 years of age. She is a pony that we need to watch in relation to her weight as she can lose weight easily. Without the work we do here at the project she just would not have survived or thrived. If you would like to donate so that we can continue this important work, please see our hay appeal or how to donate pages. 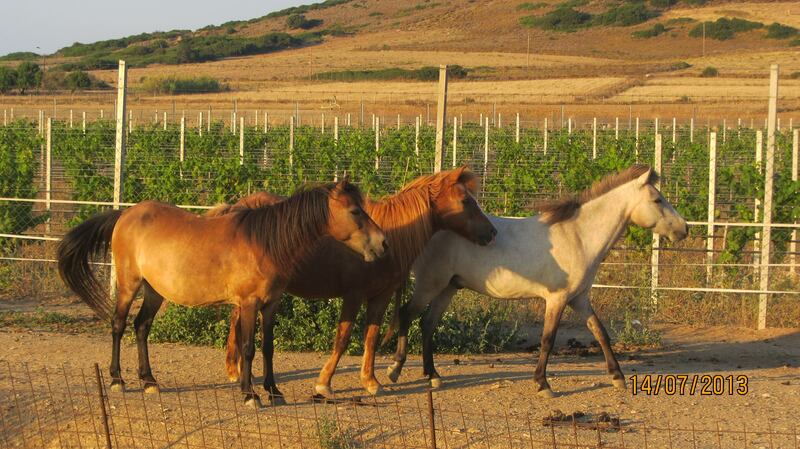 We have many welfare ponies here at the project. We hope, as and when, we have time to tell you the stories behind Agiro, Lianna, Lavender, Effie, Nefeli, Meli, Margarita, Pyros, Hera, Tratulla, Frini and Foula. Maybe one day we will also have time to tell you about our rescue dogs and cats!